What is it? What is it useful for? What are the does and don'ts? What level do I run it at? For what can be an easy overlooked component of event lighting, the “front wash” is a make or break. Broadly speaking it is the lights used out in front of the stage, pointing back at the stage onto the people on stage. The main use for the front wash is so the audience of congregation can see what is happening on stage. 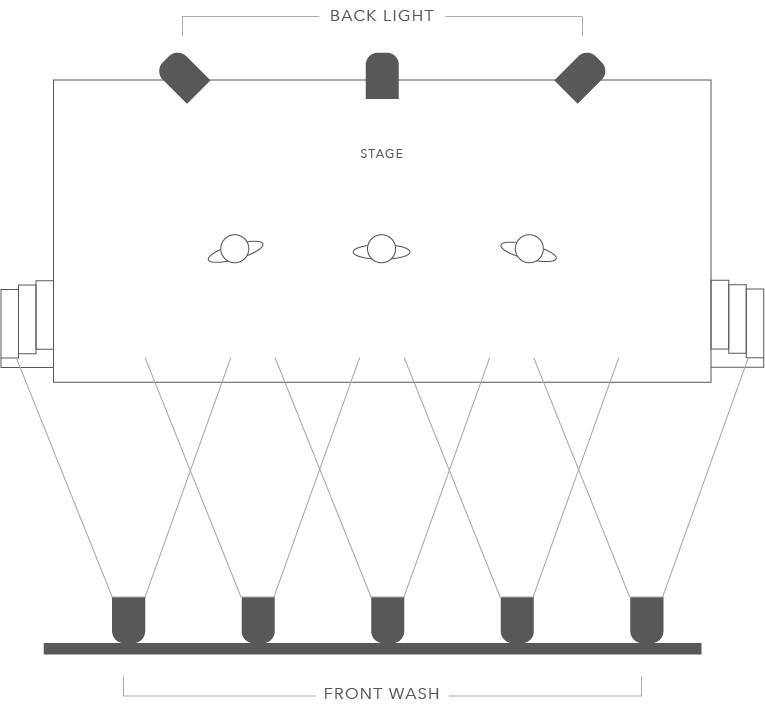 A main objective in implementing a front wash is to keep it as flat or smooth as possible, meaning that as you walk around the stage the amount of light covering the stage is as even as possible. The consequence of not having an even front wash is “hot spots”, which mean that the subject when moving will walk into an area that is a lot brighter. The best way is to actually add lights to the front wash, so each fixture overlaps the next, meaning that as the light drops off toward the outside of the focal point the next fixture is making up the difference. I normally allow a 20-30% overlap. If you are struggling with your front wash coverage, a common error is to have an even quantity of lights, a small stage may have 4 front wash lights or a medium stage will have 8, I would recommend simply buying at least one more fixture, place this directly in the middle of the lighting bar and evenly space your existing lights to either side, this will increase your overlap greatly, it will also give you a centre light which you may need to highlight a worship leader or the like. Have your front wash at the right height. What does that matter, you ask? Although a low front wash will help with lighting up more of the stage and mean that peoples eyes on stage will be well lit up, the people on stage will complain strongly (especially those not used to stage performance). The reason for this is that as soon as you turn the front wash on the people on stage will not be able to see the congregation any more, all they can see is a light in their face, much like looking into a cars headlights on high beam! Conversely, if you have the front wash too high, you start to create shadows in the eye sockets and below the chin which means that you get a very abnormal looking subject on stage. Also, and very importantly, if the audience can’t see the eyes of a people on stage they will have a very hard time connecting with that person. So whats the right height? Stage is 600mm high which equals 4.4m out from the front of stage. Although his does not mean that the end result of the front wash is 45 degrees it should be a good compromise between having it low enough not to have shadows on the eyes but not melting the preachers eyes from being to low. This is a classic point of contention that can cause some friction between production and the people on stage. Remember to see it from both sides and try work through it calmly and with good communication. A Fresnel is a purpose built lens to help make light look good on peoples skin, perfect. A profile, although can be used in the front are better used to highlight a spot or a set piece and not people. Par cans also had a breakup lens that helped with skin, the only problem is they generally don’t come with barn doors or are not zoomable, meaning the light is somewhat uncontrollable. Now with LED fresnel versions available your front wash doesn't need to be using all your power as well. What levels should I use? As simple as this sounds, I go with “what looks good”! Try to keep it looking natural, not too bright, but bright enough for the audience to connect with who’s on stage. I try to have enough lights in my front wash that I don’t need to turn it up 100%, have some in reserve if possible. This again is a classic point of contention, understanding it from both sides is key. You want it to look amazing live and they are trying to make it look amazing on camera. In reality a camera needs more light then the human eye so generally video will be asking for more light to make it look natural from their perspective. A great solution and compromise for cameras is to colour correct your front wash using Half CTB or Quarter CTB gel. Again try to solve the issues calmly and with good communication. The purpose of back lighting is to add a sense of depth. It draws the people on stage out of the backdrop, especially when seen on camera. I run this high and high. High as in height, so it doesn’t hit the people in the front row and high, as in hotter then the front wash so it is brighter and adds contrast. Less is more, not so much in front wash! Don’t skimp on this very basic but super critical area. Although I do recommend, when your front wash is not a necessity, turning the level down and let the other colours on stage come through, you will love the results.